As the weather grows progressively warmer in the northern hemisphere with the approach of summertime, amber aficionados may begin to grow nervous wondering whether they'll be able to find appropriate solutions: warm weather colognes and perfumes with enough amber to satisfy their needs but without suffocating themselves and those in their environs with the characteristically thick blanket of labdanum touted in wintertime precisely for its ability to heat up and expand to envelop the wearer. People appear generally to think of amber as wintertime fare, and that does seem right to me. Oriental perfumes, often featuring hard-hitting spices and darker elements anchored in amber, wear very well underneath sweaters as the body's heat causes little wafts of olfactory delight to project up and along one's neck. Fortunately for amber addicts there are some warmer weather choices. Wearing this weightless amber perfume is like walking on pillows. It's fluffy like whipped butter but without any oiliness whatsoever. Although Ambra is neither watery nor dilute, it also does not build up and overwhelm, even if liberally applied, which makes it a fine choice for the warmer months. I would say that this particular creation lies at about the mid-range of sweetness as far as amber perfumes go, and although I've read some reviewers who find it too sweet, I must respectfully disagree. I find this composition considerably less sweet than, for example, Histoires de Parfums Ambre 114. Ambra offers a well-balanced blend of aromatic elements which counterbalance the characteristic heaviness of labdanum amber so as to produce a fragrance which seems wearable year-round to me. I also find this creation entirely unisex and do not know why it is marketed to women. If anything, I'd say that the aromatic fir resin, the citrus, and the geranium together push this slightly toward the masculine side. In any case, the quality is beyond dispute, and I highly recommend this creation to amber lovers of all stripes, provided only that their heart's desire is to walk atop pillows! The house of Gandini boasts a heritage dating to 1896, but my distinct impression is that they may have been on extended hiatus for many decades. In any case, I learned of them only in 2012! I recently discovered their cologne series launched in 2010, and have been very happy with every one of them I've tried. Lavanda ed Ambra Oro is certainly no exception, and in fact may be my favorite of the bunch. I feared that I would not like this composition, its name beginning with the big 'L' and all, but the lavender is very subtle and smooth and is buttressed with other aromatic and floral components so that, while detectable, it is not at all loud or harsh as I often find lavender to be, particularly in unisex and masculine colognes. These colognes are designed to be combined with one another according to the wearer's desire, but I find each one to be quite good as a stand-alone fragrance, and the longevity and sillage seem more typical of an eau de toilette than a cologne. 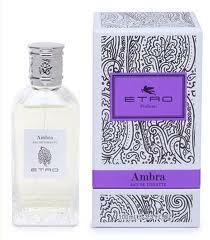 Like the other members in this series, Lavanda ed Ambra Oro is very natural-smelling and smoothly blended. Again, the lavender is downplayed, which is great news for those more interested in amber than in lavender. The amber here is ambergris, I believe, given its texture. Although ambergris dominates this composition, everything really comes together—the rose, patchouli, geranium, lily of the valley, and cedar, along with the lavender—into a seamless somewhat porous layer, making Lavanda ed Ambra Oro another excellent choice for warmer weather. The drydown of this fragrance is just beautiful, with the amber fully detectable but light and airy. I recommend this creation to everyone who loves amber, as this is a completely new take—at least in my experience to date! Although both the original Prada for women and Prada for men appear to bear Amber as their subtitle, each of those compositions seems to me to be much more about things other than amber. In contrast, L'Eau Ambrée is really only about amber, nearly devoid as it is of florals, fruits, and soap. This perfume offers a very light veil of amber which swiftly dries down to what is essentially a skin scent with low sillage. Very subtle and only slightly ambery, L'Eau Ambrée may be the ultimate summertime amber scent. It does not morph into anything unforeseen and unpleasant even under conditions of extreme heat and humidity, which is obviously important in places such as Boston where during the summer months the temperature may unexpectedly spike to 90F or more for up to a couple of weeks at a time. To my nose, this scent seems very straightforwardly to be labdanum amber, although ambergris is listed as a note. What I like about this composition is that although it presents amber in all its glory, it manages to be light and ethereal without seeming just plain dilute. I am not generally speaking a fan of what I describe as “thin oriental” perfumes, which often just seem weak and effete, as though the house may have simply thrown in a bunch of extra solvent to increase the volume. In the case of L'Eau Ambrée, the creation seems complete, and it does not strike me as a case of simple dilution, say, of one of this house's other self-proclaimed amber perfumes, Prada for women or Prada Homme/Amber. Somewhat confusingly, Prada for women is sometimes referred to by reviewers as Prada Amber as well, so I am not entirely clear as to whether Prada Amber for women is supposed to be an entirely different perfume or not. In any case, I can certainly affirm that L'Eau Ambrée is a distinct creation, not a dilute solution of either of the two original eponymous launches, whether for women or for men. I would compare this creation favorably to the first L'Artisan Parfumeur amber perfume—for better or for worse, depending on your perspective. If you find one of these perfumes boring (as some reviewers evidently do...), you'll find the other one boring as well. On the other hand, if a simple, natural-smelling but light presentation of amber is what you're after, without the complications of spices and big florals and various and sundry other bells and whistles, either of these creations may work for you, and this one seems to me perfect for hot-weather wear. Of all of the light amber perfumes I've encountered, Prada L'Eau Ambrée is by far the lightest!